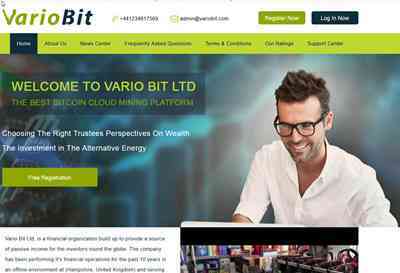 Quote: Vario Bit Ltd, is a financial organization build up to provide a source of passive income for the investors round the globe. The company has been performing it's financial operations for the past 10 years in an offline environment at (Hampshire, United Kingdom) and serving the investors with the best returns in the market. Vario Bit invests in the Crypto Currency and mining of Bitcoin, as well as other resources of income that includes but not limited to Land, Real Estate, Stocks and Bonds. We have been generating a stable passive income for the investors from last 10 years and are proud to have this consistency going. After such a long journey, Vario Bit has decided to open up the service officially for the investors round the globe. Now one can see his money growing with such an ease and the passiveness will become viral. 02.12.18 22:06 Account Transfer -170.00 Sent Payment: 170.00 USD to account U14217029 from U1294xxx. Batch: ‎204952471. Memo: Shopping Cart Payment. Deposit to variobit.com User allhyips.